The slide in the euro vs dollar continued once again yesterday, with the currency pair ending the trading session with a wide spread down candle, but one which ended on a positive note, as the close of the session found some good support from the 40 day moving average, suggesting that the recent pullback may now be finding a floor at this price level, and as a result we could see a bounce higher from here in the next few days. However this technical view must be counterbalanced by the fact that yesterday’s price action breached a minor support level in the 1.48 price region, suggesting that the current move lower has some momentum, and therefore we need to be cautious in our trading in the short term as the overall picture is far from clear. 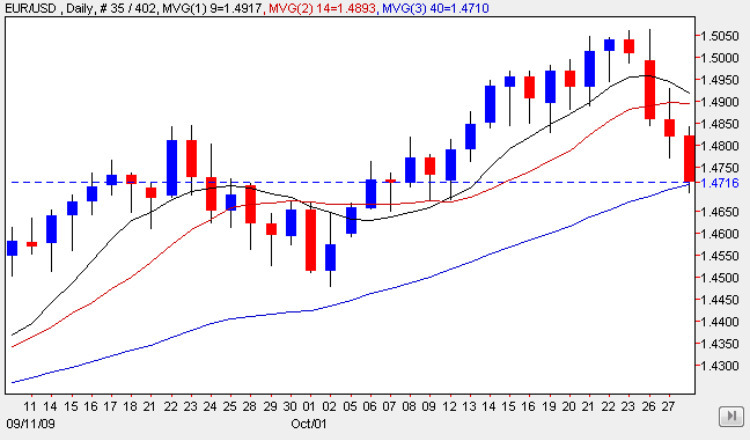 The principle reason, of,course, for the current move downwards is the recovery in the US dollar which has been evident on the USD index over the last few days, and whilst this is a long way from a major shift in sentiment, it does suggest that we may be seeing the start of a rally for the US dollar, with a consequent fall in the euro vs dollar as a result. The fundamental picture remains unchanged with the US economy still langushing in recession, and until the FED signals a change in policy or interst rates ( which seems very unlikley at present) then the US dollar will remain the low yielding currency of choice for the carry trade. Once this position changes then this will add considerable momentum to the dollar with a consequent sell off in the euro. Whilst I do not believe this is the situation at present, as technically the euro vs dollar chart remains firmly bullish, we do need to be cautious and maintain an overall picture of both the technical and fundamental issues currently in play. Items of fundamental news on the economic calendar for Europe and the US started earlier with the German Unemployment Change which came in better than expected at -26k against a forecast of 17k declining once again in October giving some hope that the worst of this downturn may be over. This was followed by the Europe Consumer Confidence number which came in at -18, marginally worse than the forecast -17. Later today Deutsche Bundesbank Present Axel Weber is due to participate in a panel discussion about the German economy at the German Bankers Association in Berlin. Weber is also a member of the ECB and considered to be one of their most influential members so traders will be paying close attention to his words. Market focus then turns to the US where the Unemployment Claims are due for release at the same time as the quarter on quarter GDP number – both level 1 items and likely to cause a major market reaction. The forecast for these is 522k and 3.2% respectively. Other items for the US include the Advance GDP Price Index expected at 1.2%, testimony from Treasury Sec Geithner before the House Financial Services Committee on the topic of systemic regulation, prudential matters, resolution authority and securitization. Finally we have the natural gas storage data. You can keep up to date with all the latest fundamental news on the economic calendar, latest currency news and live currency charts by simply following the links. I have also included details on an excellent ECN broker.